Game News: 3DS sales hit 4.5 million in the states. 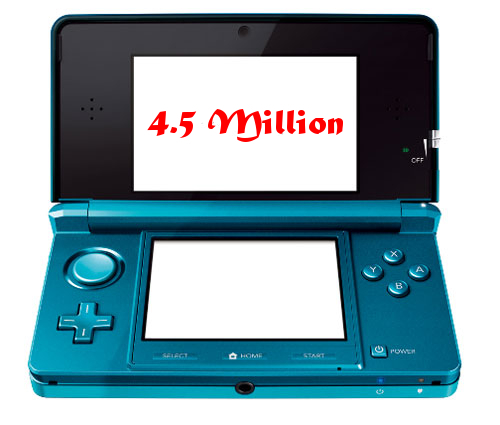 Nintendo of America has revealed that the Nintendo 3DS has sold 4.5 million units in the United States in it's first year. The 3DS had a shaky start with a poor launch line up and high price. Nintendo were quick to fix the sale issues with a price drop just six months after launch. Sales then boomed and The launch of key titles such as Mario Kart 7 and Super Mario Land 3D also had a huge effect on sales over the holidays season. The 3DS is close to doubling the original DS' first year sales. The original DS sold 2.3 million in it's first year. Unfortunately Nintendo are still expected to announce there first financial loss in 30 years at the end of the financial year. Hats for Nintendo! Amazing how their sales bang like that after the wobbly start.